HSEE Application Form 2019 : HSEE is a national level examination conducted by IIT Madras. Application Form for Humanities and Social Sciences Entrance Examination is made available on the official website of IIT Madras. The application form is available only via online mode. The candidates who want to take admission in 5-year Master Programme, can apply for admission online through the official website or a link given below in the article. visit the official website http://hsee.iitm.ac.in/. Now open online HSEE Application portal. Read instructions and click on processed to online apply. Do registration and get Registration Id and password. Log in with HSEE Registration id and password. Now an HSEE – 2019 candidate registration form is available on your desktop screen. In this registration form enter your name, email id, phone number etc and click on get register button. Now click on the login button (After registration candidates can log in with registration id and password) and enter your registration id and password. Click on the login button. When a candidate is a log in an application form is available on the candidate desktop screen. Enter all the essential details in application form. Now attach all the required documents, scanned passport size photo and signature. Pay examination fee by through Indian bank e-challan or through Net banking/ Credit card/ debit card. 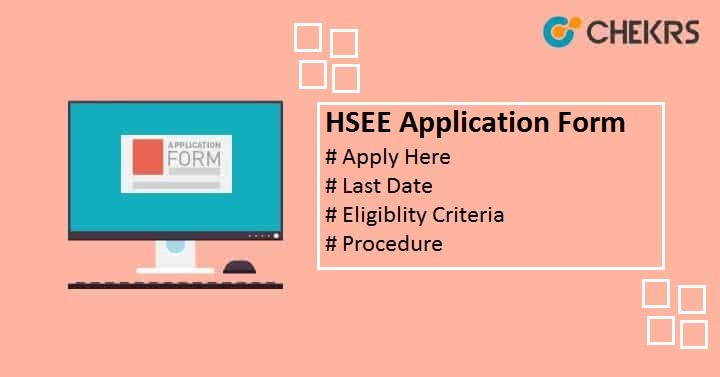 The application fee for HSSE Application is differed according to the category. In below table application fee is mention with the category. Candidates can pay the application fee by Indian bank e-challan or through Net banking/ Credit card/ debit card. What After Filling Application Form? After filling Application form you need to start your best possible preparation for this exam. To reduce the burden we are providing an easily understandable Article, focused on HSEE Syllabus and HSEE 2019 Admit Card will be available only online. It will not send by mail or post. In our above article HSEE 2019 Application Form direct link is provided for the help of students or parents. Guys if you have any query then comment us in the comment box. We will provide the suitable solution for your problems.